I do have a somewhat perverse affection for "cautionary tales," but Pierre I genuinely like. I love how it sounds so intentionally off-putting-- Pierre: A Cautionary Tale, in Five Chapters and a Prologue, with about 50 pages of text and "a suitable moral" at the end. What self-respecting, Play-doh-eating preschooler would pick that up and think, "Yes, this is the book for me!"? His parents leave Pierre alone while they go to town (cf "Mother Love") and while they're gone, "A hungry lion paid a call / He looked Pierre right in the eye / And asked him if he'd like to die." The specter of imminent death should be a harsh reality check for the tyke, but no, he replies, naturally, "I don't care." So the lion ate Pierre. 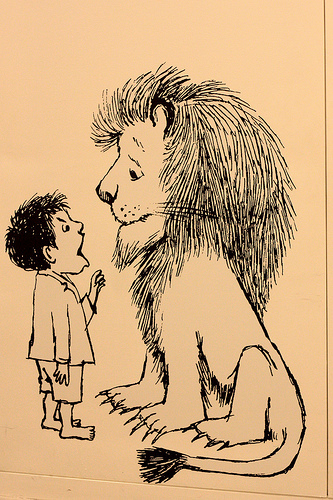 Pierre's parents come home to find a lion in their son's bed who says "I don't care" in a suspiciously familiar voice. They take him to a doctor, who flips the lion upside down and shakes Pierre out. The lion offers Pierre a ride home if he would care to climb on him, and this time Pierre decides he does care. The lion stays on as a weekend guest, which must have been awkward since he'd already tried to eat his hosts' son, but maybe he brought a really good wine or something as a nice hostess gift and that smoothed things over. Oh, this one's easy. "The moral of Pierre is, 'care'!" Sendak, Maurice. Pierre: A Cautionary Tale. New York: Harper Collins, 1962. I've always loved this book. The rhymes work so well. I like the fact that, like many children, Pierre has somewhat esoteric tastes. I, for one, was very fond of Cream of Wheat as a child, and I can understand a certain fascination with folding chairs.